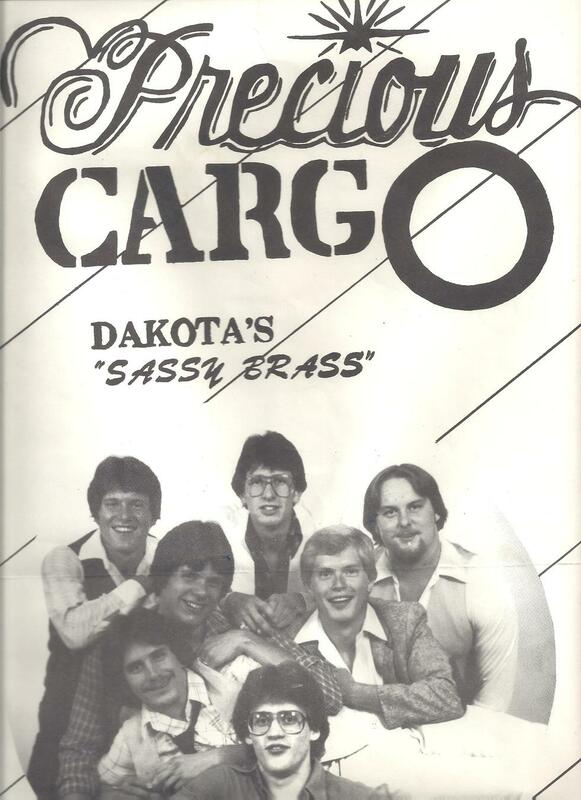 Precious Cargo formed in the fall of 1977 by founding members Roger Mitzel, Scott Geffre, Mark Hanson, and Dan Steinwand, who had been playing together in Aberdeen, SD, for a number of years in a non-denominational Christian praise group. The four played local junior high venues and various youth get-togethers. The name Precious Cargo came from a jazz band chart that they had all played. Word of the band spread among Northern State music students. Paul Weidenbach, a trumpet player with some keyboard experience, was next to join. Fall 1978 was a turning point when Rick Sabol, a trombone player at Northern, showed up with some Chicago horn charts. The band entered the Miss Snow Show talent contest in Aberdeen and played “Beginnings” by Chicago. The performance was well received and planted the seed with the group that they were on to something special. Bart Torbert joined on keyboard and sax, and the band was on its way. Known for their versatility and vocals with songs by the Doobie Brothers, Chicago, Tower of Power, The Commodores, Chuck Mangione, and more, the band became a favorite at high school proms and other dances. They also played at Northern State and SDSU. In Aberdeen they played at Snoopy’s, The Lumber Company, The Sheraton, and other venues. Precious Cargo was made up of high school students and college students, so members graduated, got married, or moved on for various reasons. They simply made decisions that took them away from the band. But Northern and the Aberdeen area continued to provide talented people willing to step in. As this trend continued, it became harder to maintain and manage a seven-piece group. The band decided in the summer of 1981 to convert to country/rock, first with five members, then four. Even with this change, the original Precious Cargo style remained at the heart of the band, including improvisational brass riffs when possible and keeping many songs from the original repertoire. By this time the band was playing virtually every weekend. Three members moved to Texas in the fall of 1985 to play as a touring band. This continued until spring 1987. Of the 21 members who played with Precious Cargo over the years, 15 planned to return for the induction concert, bringing together people who have not seen each other in over 30 years and confirming the bond that fellowship through music creates. Many members returned to Aberdeen in 2012 to play to a packed house at a reunion concert. Roger Mitzel has been the driving force of Precious Cargo for most of its existence. He continues to play and perform. One member, George Kretchman, is deceased. ** indicates members planning to attend the Hall of Fame activities.